U.S. Mint Director David J. Ryder and representatives from the U.S. 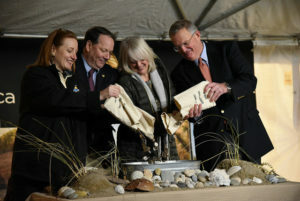 Fish and Wildlife Service and Rhode Island government participate in the ceremonial coin pour. The ceremonial launch of the Block Island National Wildlife Refuge Quarter took place on November 15, 2018, at that the Kettle Pond Visitor Center in Charlestown, RI. A crowd of 325 gathered for the outside, tent event despite the cold weather and approaching storm. Students (100) were also in attendance, in addition to those who watched the live stream of the event at the Block Island School. Rhode Island National Wildlife Refuge Manager Charlie Vandemoer served as Master of Ceremonies for the ceremony. David J. Ryder, Director, United States Mint; Margaret Everson, Principal Deputy Director, U.S. Fish and Wildlife Service; and James Kurth, Deputy Director, U.S. Fish and Wildlife Service performed the much-anticipated coin pour. Janet Coit, Director of the Department of Environmental Management, presented brief remarks on behalf of Governor Gina M. Raimondo, who was unable to attend. Also in attendance was U.S. Mint Artistic Infusion Program member and designer of the Block Island quarter, Chris Costello who was on site to meet attendees and autograph rolls of quarters, event postcards, and programs. Local students enhanced the ceremony by sharing their respective talents. Boy Scout Troop #15 presented the colors as Eagle Scout Cody Clarkin recited the Pledge of Allegiance for the crowd. Additionally, the Chariho High School Student Choir performed music for the ceremony, including the singing of the National Anthem. Bringing the coins to the hands of many, Washington Trust Bank was on site and exchanged $12,000 quarters. A coin forum preceded the event on November 14, inside the Kettle Pond Visitor Center with 35 attendees. Director Ryder shared information about upcoming Mint programs. Preceding the director, Dr. Peter Payton, Ornithologist from the University of Rhode Island, gave a 30-minute presentation on birds featured on the America the Beautiful Quarters® Program coins. 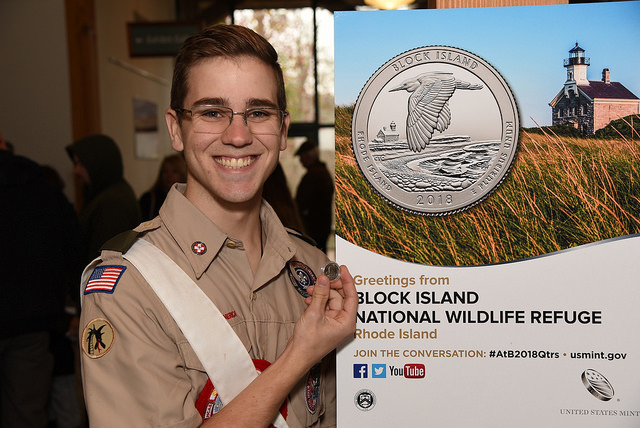 Eagle Scout Cody Clarkin from Boy Scout Troop #15 poses with his new coin following the quarter launch.